Supersized Capacity - Get up to 10,000 card templates and 30,000 transaction logs - more than enough to fulfill the requirements of an SME. Workcode - Let your staff experience more independence by reporting their whereabouts via our workcodes feature. Easy Data Management - All you need is a USB flash disk to transfer transaction logs to your computer. It is that easy! Combine Your Verification Method - Opt for the combination of verification methods to secure your workplace further. 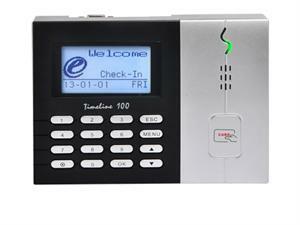 Choose the Card and password verification with the TimeLine100 for tighter security. User-Friendliness - The TimeLine 100 is not only easy to install, it is also comprehensive in its user-friendliness. Short Message Display - Alert your staff by personalizing a short message to be sisplayed at the terminal when they verify. Value for Money - This model was designed to be economical so that you are able to implement FingerTec solutions at a lower cost. We believe that when it comes to business and security, there should be no compromise.